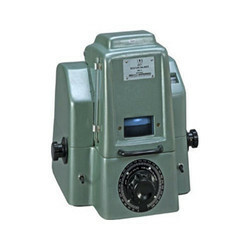 Pioneers in the industry, we offer infra red moisture balance, abbe & hand refractometers, abbe refractometer, polarimeters and projection microscope from India. High Performance compact dependable measurement of moisture content of materials not effected by radiation why loosing water under moisture exposure. A high performance compact, dependable infra-red Moisture Balance for measurement of moisture content of materials not affected by radiation while loosing water under of moisture exposure to infra-red radiation. The 250W infrared lamp gives great generation of heat which is controlled by auto transformer. The balance is calibrated in terms of moisture percentage 0-100% and is read directly on the instrument. Abbe Refractometer provides quick, convenient and accurate means of determination of refractive indices till the estimated fourth decimal and also dispersion of liquids and solids. It is widely used for purity studies, quantitative analysis, determination of soluble sugar and fats in sugar solutions, confectionery products, pharmaceuticals products, Chemical & prepared slides, glass and synthetic crystals etc. Abbe Refractometer capable of measuring the refractive index of is ideally suited where a wide refractive index measurement range is required. Easy to read index scale on translucent glass sharply visible through transmitted light. Quick and convenient determination of refractive index and dispersions till the estimated forth decimal. Large dull knobs permits speedy convenient setting of dividing line. Horizontal loading of prism housing prevents flowing down of test liquids. Thermometer has a range 0-60 DegreeC and can be adjusted to convenient reading angle. 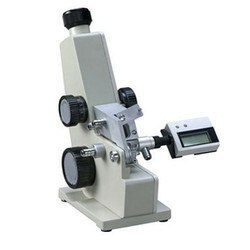 Highly precision Abbe Refractometer is a handy measuring instrument for determination of refractive and dispersion properties of solid and light substances. The incorporation of precision glass circle, scale plate with minutely finished rotating mechanism and tropic proof high sensitive optical system enable the precise reading of test result without the aid of vernier. Wide Applications are conveniently used for the determination of the rotation of all optically active substances in testing oils, medicines, sugar and albumen in urine, foodstuffs and products of brewery, recommended specially for Medical, Pharmaceutical, Daily Development, Chemical Laboratory examinations. Ease of OperationDue to the incorporation of precision glass circle, a scale plate with minutely finished rotating mechanism and Tropic proof highly sensitive optical systems, the test result can be read precisely and directly without the aid of a vernier. Rigid attachment of the illumination lamp to the instrument reduces wearisome adjustment to a minimum. Dual Scale Its highly accurate glass scale is divided to read angular degrees and also carries sugar scale in I.S.S. Units. The angular scale from 0 to 360 degrees is sub-divided to 1 degree to enable direct reading to 0.5 degree and by estimation .02 degree. The sugar scale from 30 Degree to 120 Degree I.S.S. Units enables directs reading to .1 and by estimating of .05 sugar degree. Condensor Movable Abbe Condensor N.A. 1.25 with iris diaphragm and filter holder. 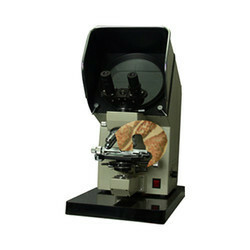 Projection Microscopes suitable for measurements and group discussions. Projection Microscopes incorporate the most advanced technical features to make it versatile for a wide range of applications in Research and Industries. The Din Standard Plan Achromatic Optics produces uniformly images and exceptionally sharp resolution over the entire screen. The 195 mm round graduated screen made from the finest glass is rotate able in 360 Degree on ball bearing and has a fresnel lens behind it for brilliant and uniform intensity of projection throughout the screen area. 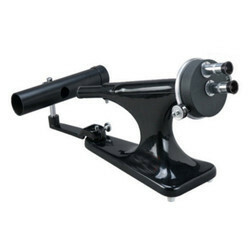 The Co-axial mechanical stage is attached for comfortable and convenient manipulation of slides for research works, like checking linear measurement and comparison of contours etc. A magnification correction knob is provided in the microscope on which a compensating eyepiece moves to attain exact magnification in different objectives. Optical System Din Standard TC Series objectives, Optionally/Plan Optical System. 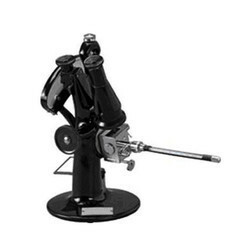 Main Body A most durable, sturdy & elegant designed body for utmost convenience to use and to accept several optional accessories as a multipurpose system microscope. Focussing Coarse and fine focusing system. Coarse focus range 30mm and fine focusing reading to 0.002 mm. Illuminator Halogen illumination system having 12V/100W Halogen lamp with variable lightcontrol. Observation Observation on screen /optionally binocular head. Looking for Analytical Instrument ?